Photo of Justine Johnstone and photo notes from The New York Times' tumblr The Lively Morgue. Thanks for the tip, Meg. "Miss Justine Johnstone ("The World's Most Wonderful Woman"), former musical comedy star, and at present headlining on the Orpheum Circuit, is a lover of all outdoor sports; golfing, swimming, and football being her favorite hobbies. Extremely proficient in the first two and enjoying them to the utmost in her leisure hours, her greatest love is for the game made famous by "Red" Grange. 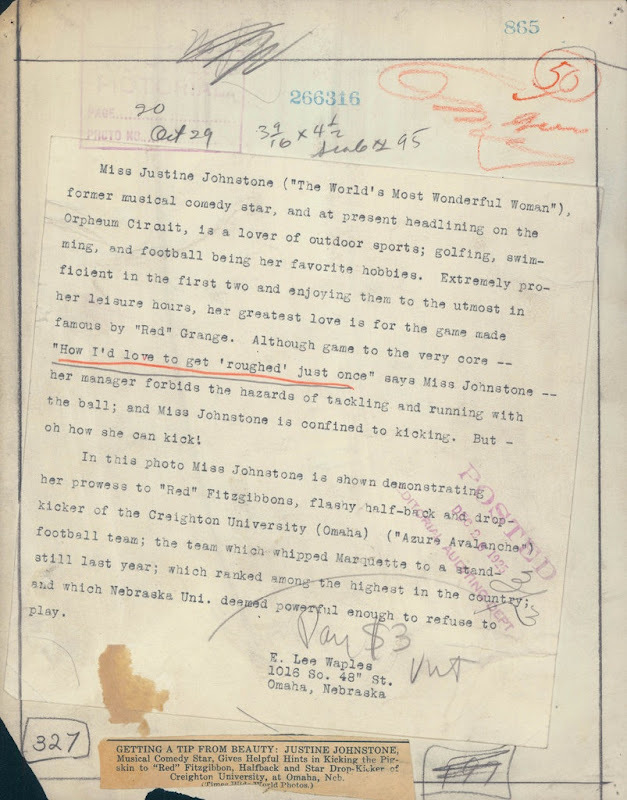 Although game to the very core—"How I'd love to get 'roughed' just once" says Miss Johnsone—her manager forbids the hazards of tackling and running with the ball; and Miss Johnstone is confined to kicking. But—oh how she can kick!" Wow. These photos are absolutely interesting and thanks for sharing! Great photo - bet Justine was a hot shot footballer! That's a fantastic excerpt with an equally brilliant photo. lol, is that a time travelling scott schuman?